Yesterday I wrote Yes, You Can Gain Visibility, mentioning those times when introverts struggle with being seen and still maintaining the introvert comfort. 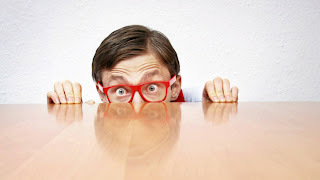 In the article, 10 Ways Introverts Can Get Noticed at Work, Jhaneel Lockhard refers to my favorite author, Nancy Ancowitz, when he says Prepare for the times you have to step out of your comfort zone. Continuing the idea of being seen, let’s approach it now from another perspective – being seen within your organization. Most attorneys start out in a firm where, for the first few years, work is provided to them until they can prove their own ability to originate or business build on their own. From the partner perspective, this is not a time to rest on their laurels of simply being qualified to do the work. The associates must also demonstrate their confidence in doing so. I once had a client who was struggling to take initiative in firm meetings. She attended, and she had intelligence to share, yet her meeting behavior held her back in many people’s eyes. Eyes averted, and head turned down, her nonverbals spoke aloud her lack of confidence. Further behaviors of not speaking – whether to confirm or add to the conversation – forced her supervisors/partners to not only be concerned about the tone she set at firm meetings, but also gave concern about her handling of clients. Lockhard and Ancowitz suggest preparation is important when anticipating visibility. Whether we are attending internal or external meetings, consider what agenda items you will be able to offer insight in. Further, stepping out of the comfort zone means connecting. It means getting out of our head and into the present with those around us. It means initiating conversation as well as simply participating in it. So as you prepare which items to speak to, make notes on how you will keep your ideas in bullet points, clear and concise. We introverts who get out of their head when with others – still listening, still observing and still reflecting – allow those around us to trust us. That’s worth getting out of our comfort zones.